Composed by Edvard Grieg (1843-1907). This edition: 2 copies required. Duet or Duo; Masterworks; Piano Duo (2 Pianos, 4 Hands); Solo Small Ensembles. Kalmus Edition. Form: Concerto. Masterwork; Romantic. Book. 64 pages. Kalmus Classic Edition #00-K03487. Published by Kalmus Classic Edition (AP.K03487). The Piano Concerto in A minor, Op. 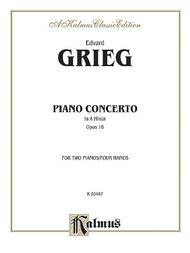 16, by Edvard Grieg (1843--1907), was written in 1868, and was the only concerto Grieg completed. It is one of his most popular works and among the most popular of all piano concertos. 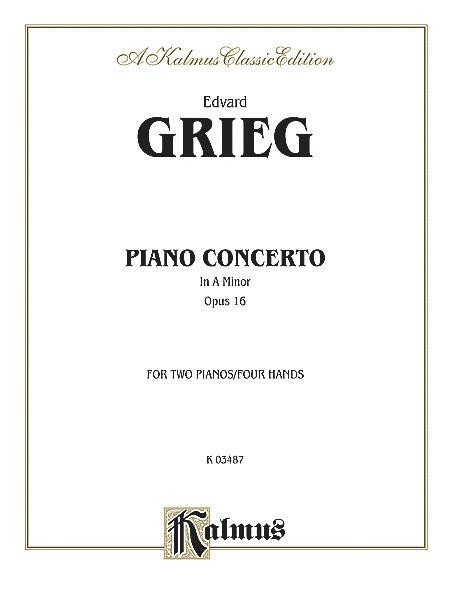 This score is for two pianos, four hands, with the second piano part being a reduction of the orchestral score. Two copies are needed for full performance. 65 pages. The title says it all. Buy what editions you can afford when they are on sale.